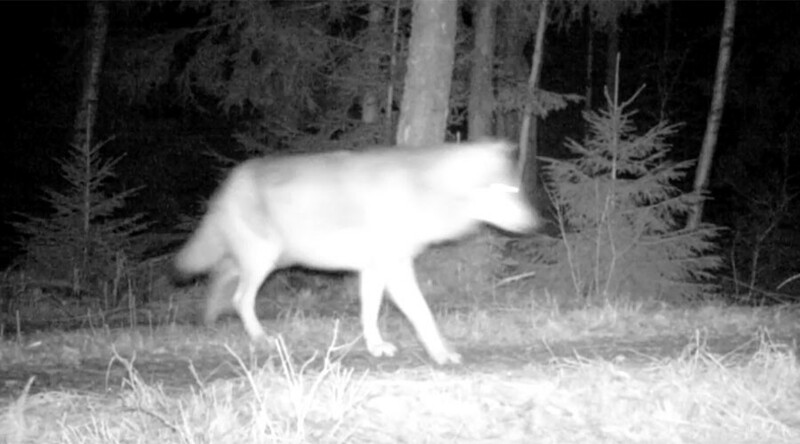 An elusive wild wolf roaming around Sweden has been caught on camera for the first time ever in the Scandinavian country. Recorded in the rural village of Lonsboda, it’s rare for such sightings at all, let alone capturing it on video. The estimated population of Swedish wild wolves stands at just over 400, according to Sweden's Environmental Protection Agency, but local authorities wanted to pin down how many were roaming the lands of the Skane region, so they set up a number of hidden cameras. "We have also secured droppings from the wolf, which we have sent for analysis," said Skåne's wildlife officer Nils Carlsson told The Local. "Soon we shall know the wolf's gender and where it comes from." This sighting comes only two weeks after two young lynx were caught on camera roaming the woods of Blekinge in southern Sweden, and is also seen as further proof of an increase in carnivorous animals across the continent. These two wild cats were also captured on hidden cameras set up by authorities. Lodjursungar i Blekinge fångade på film. Fotograf är Le Carlsson. Den första februari fångade en av våra kameror tre lodjursungar på film. Vi har 30 kameror i gång runt om i länet och har fått bilder vid närmare 20 tillfällen på ett tiotal platser. Kamerorna är viktiga för att vi ska få en bra kunskap om hur många lodjur vi har. Inventeringen pågår från den 1 oktober till sista februari. Hittills har vi dokumenterat tre familjegrupper i länet: norra Olofström, norra Karlshamn och östra Karlskrona kommun. Alla finns på bild, men två av familjerna har vi även kunnat spåra på snö. Ungarna på filmen är från norr om Kyrkhult. Fotograf är Le Carlsson.För ett bra resultat i inventeringen är det viktigt att allmänheten rapporterar om man ser lo eller något annat av de stora rovdjuren. Man kan rapportera via skandobs.se eller telefonsamtal till våra rovdjursspårare/besiktningsmän. Dessa hittar du på Länsstyrelsens webbplats. Although considered near-extinct in the 1970s, and now protected under European law, Swedish authorities try to maintain a set number of such wolves across the state through regulated hunting. In December 2015, a Swedish court ruled that a total of 14 wolves could be killed from January 2 to February 15, 2016, while the Supreme Administrative Court finally settles the legalities of such a hunt. A total of 46 were initially sought to be killed.